Chirp! Welcome to my new home!! 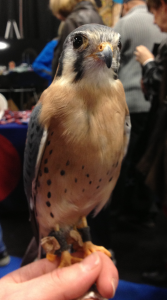 Gratuitous kestrel – Squire, a traveling ambassador from Busch Gardens. You know how it goes when you try to come up with username somewhere, right? All the good ones are taken? Whatever you think up feels contrived, but has to do because you just can’t think of anything. Well this ain’t that. Back in November I did the Whole Life Challenge with my sister and a friend of mine. We went back and forth quite a few times trying to come up with a name for our little team… and nothing sounded great. A lot of things just sounded lame. However, late one evening I was driving home from work and chatting with my sister on speakerphone. While we were talking something made me think of a trip I made to Smith Point, TX. It was borderline time for hawk migration and hey, you start talking hawks I get all excited. I started telling my sister about kettling – when the raptors are all together in the sky it’s pretty amazing to see. She’s not a bird nerd, but she laughed when I used the term “kettling” – because quite often in this challenge, we planned to be using kettlebells for our workouts. The more I thought about, the more I loved the name. So I registered the domain and am launching it into the new year! This will collect things, ideas, and friends that strengthen me, give me joy, and hopefully, help me be the best me ever (not the least of which is my sweet hubby, Scruff). Lots of goals… too little time to work on them. In any case, more to come in the new year! I hope you have a great New Year’s Eve, with many awesome plans for the future.